Dwarven Monster Slayers is a coop multiplayer action-RPG that blends old school role-playing gameplay with survival and stealth mechanics. The game features team-based combat, exploration of an immersive and vibrant underground world, a gripping background story, loot hunting, sandbox elements and much more. Alltogether, the game aims at creating a fluid gameplay that feels fresh and familiar at the same time. Dwarven Monster Slayers is a game made by pen & paper role playing guys. So, naturally, it is heavily inspired by classic fantasy lores such as the Lord of the Rings. The game aims at providing a kind of old school RPG feeling involving typical game mechanics that you may like. For example, you play a dwarf and you can build up your character during the game’s progress. You gain experience, raise your level, distribute skill points, collect items, improve your equipment and develop your character. 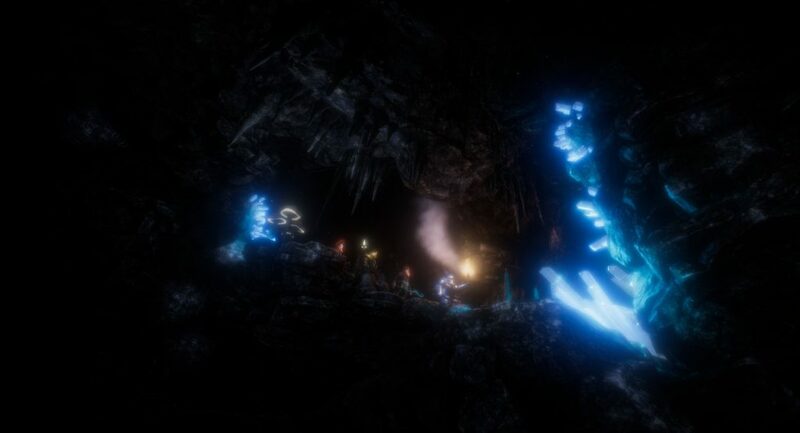 As it regards combat, you will experience tactical and fast-paced realtime battles and each character class has access to an unique array of spells and abilities. Moreover, each dwarven character has it’s very own personality and motivation and there are exclusive pieces of the background lore which can exclusively be revealed when playing a particular character. As in many other RPGs you can experience this adventure in a group – this is a cooperative game after all and so it does reward team work. While you can still play the game alone, you will be more effective as a group and it is probably more fun as well. In a team you can best utilize the different strengths of the particular dwarven classes and compensate their weaknesses. Also, you will probably need a group to be ready to face the highest difficulties and challenges later on. In this game we really want to create a credible, vivid and authentic fantasy world. We want to answer questions such as: How did the old dwarves lived under the mountains back in the days? How was their daily life and culture? What happened to them? What happened after their dissapearance and what about all these monster that now live in their dungeon? What do they do all the day? Waiting for heroes to come by and smash them? Probably not. This game is much about telling the story of the old Berethil dwarves. The lore deals with the Kargarath underworld and it’s mystersious inhabitants and focuses on the rise and ruin of the dwarven kingdom of Berethil. Piece by piece you will reveal the lore by exploring ancient areas of the underworld and by collecting books and diary pages written by different characters. These characters have written down their stories and experiences and allow you to reveal the background lore from multiple narrative perspectives, even inlcluding monsters and villains. Speaking of monsters, there are plenty of them, walking and lurking around in the underworld realms. While many monsters might be savage, they are not mindless. Instead, they are fully AI-powered. If a monster sees you, chances are that it will attack you. However, if you hide behind a corner, or in the shadows, a monster usually won’t take notice. So, stealth can be an option to completely avoid particular encounters if desired. In addition, speaking of a credible world, monsters of different species and factions will even fight against each other. This can be used as another strategic option to solve certain problems. Note that additional information on monsters is provided on this page. This game also involves survival elements to further approach the goal of creating an immersive, believable world. For example, you will need food, water and sleep to continue your journey. If you are too tired, you need to create a base camp and take a rest. Base camps also provide a safe spot and mark your progress in the underground world so you better keep an eye on your crafting materials to be ready to build a camp if necessary. Then, while you are sleeping, chances are that monsters are not. This means that the world around you can change during your sleeping hours. For example, new monsters might arrive, create their own camps, lock doors, build barricades, etc. So, each playing day will be a unique experience.